Rugby Town travel to Cogenhoe United for a reinstated UCL Premier Division fixture this Saturday looking to extend their unbeaten league run to ten matches. 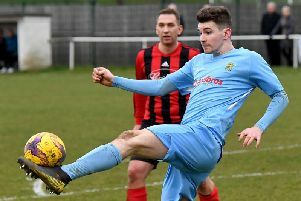 Valley’s weekend 2-1 victory over Rothwell Corinthians meant it is now 25 points out of the last available 27 for Carl Adams’s men, whilst they also preserved their unblemished Butlin Road league record this season in the process. However their latest success was undoubtedly the least convincing of their seven home UCL wins to-date, with the visitors working hard to frustrate Town. Goals from Richard Blythe and Charlie Evans saw Rugby home in the end though, and Adams will be hoping for a more fluent performance when they travel to the village just south of Northampton on Saturday. Cogenhoe were re-formed in 1967, after having previously folded in the 1950’s and they first entered the UCL structure in 1985. They finished in 8th place last season, with their best performances in the league coming around the turn of the century when they recorded runners-up spots in both the 1999/2000 and 2000/01 campaigns, before managing to win the Premier Division in 2004/05. The weekend’s game had originally been postponed due to the hosts continued participation in the FA Vase, but United were then thrown out of the competition after being found to have fielded ineligible players in their victory in the previous round against Leighton. Valley will have to be on their guard on Saturday though, as Cogenhoe come into the game on the back of a four league match winning streak of their own, and last weekend’s 3-1 success over Peterborough Northern Star lifted them up to sixth place in the 2018/19 table. Rugby’s victory over Rothwell cut the gap between them and Daventry at the top to seven points, after their local rivals could only draw 2-2 at home to Desborough. Daventry managed to salvage a point thanks to an injury time equaliser in a game which had originally seen the hosts take the lead in controversial circumstances on the stroke of half-time. Town have played two less games than the current leaders, and they enjoy a five point advantage over current third place incumbents Deeping - who visit Butlin Road a week Saturday (8th December). Following on from the Deeping clash, Valley then face back-to-back away fixtures at Newport Pagnell and Wellingborough Town on the 15th and 22nd of the month respectively, before they are due to play three successive home games over the Christmas and New Year period against Daventry (26th), Oadby (29th) and Leicester Nirvana (5th January). Rugby’s Dom Perkins will be back available this weekend having served his one match suspension for totting up five bookings in the league, with top scorer Danico Johnson also free to play at Cogenhoe as his booking against Rothwell was only his fourth in UCL competitions - the other having come in the FA Vase at Boldmere. # The coach to Compton Park on Saturday will leave from outside Rugby School at 12 midday and then pick up from Butlin Road at 12.15pm. For latest information contact Tony Mann on 07970 691366.